In discussions with the Emergency Department (ED) nurse Colleen after the miracle, I witnessed a pivotal moment. She had not yet experienced that elevated point of instruction, which Protestants call ‘Born Again’; but she would. That was in her future. Instead, this most sublime Christmas gift enticed from the privileged few of us working that Christmas, wonder and a mystic curiosity…. It is Christmas and I’m working: 2 unremarkable statements until you string them together like that. Christmas Eve and Christmas Day 1996 and I’m pulling shifts at Morongo Basin Ambulance instead of at home with my family. I’m very pensive regarding this noteworthy piece of scheduling. In my 46 years, I’d been at home with Mom and Dad for 45 consecutive Christmases! This was going to be the 1st deviation in a life-long unbroken cavalcade of warm-n-fuzzy family celebrations. All the sisters and grandchildren, maiden aunts (including me) are ALWAYS there! And we’re good at this family stuff! Often beginning at dawn (following late night services) we’ll open gifts non-stop until noon or later, pausing to receive visitors and enjoy home-baked goodies. We have traditions dating back almost half a century. So what am I doing at work? Who calls 911 on Christmas? Emergency medicine requires 24-hour/day coverage irrespective of holidays. Many of my co-workers with young families really needed this time off. My personal family traditions didn’t carry so much weight in comparison. That explains the ‘why’ of working my very first Christmas. I had no concept of the lesson to be learned from the ‘who.’ That is, I had no conception, yet. We received a call late 12/25 to the apartment of a 100-year-old female in an independent living facility. We would learn her name was Lily. The dispatcher informed us she had been the victim of a fall. Numbers of centenarians are surely increasing but never had I attended a patient of that age living independently. Lily’s apartment was tidy, decorated sparsely for Christmas, tiny and endearing. She, too, was tiny and endearing though in obvious alarming distress. She attempted to maintain her composure, smiling and trying to be helpful through her wincing and guarding. My partner and I performed a primary assessment; it looked like dozens, perhaps hundreds of similar calls I’d seen and heard phoned in as senior fall victims. She sustained shortening and rotation of the leg and foot on the affected side, increased pain with palpation to the hip; the classic fractured hip. Dan and I gingerly moved her to the gurney for transport to the ED. For an emergency responder, trained to do no harm, the reversal in status of a patient rings responder bells. To watch this dear one slide from sweet sufferer to ashen shadow, withering but not complaining, brought an answer of sorts to my Christmas self-inquiry. The ‘who-calls-911-on-Christmas’ took graphic form inside me. I began to suffer with her, dangerous for those of us in the business. I’ve heard how excruciating femur fractures can be, intense beyond description. Where Lily had been smiling half-heartedly, conversing between small gasps, now she lapsed, Deteriorated. Caved-in, barely able to whisper. Oxygen was not reviving her and the hospital was too close to obtain morphine orders. The bumpy ride from the back of the ambulance into the ED further challenged Lily’s strength. She sank, grey and wilted into the bright white of the hospital setting. We moved her as carefully as possible to the hospital bed, hooked her up to the cardiac monitor and pulled the privacy curtain. Little Lily was safe for the moment if exhausted by protracted pain. Meantime, a look around the ED confirmed we were far from alone. Many unfortunates answered further my Christmas queries. Nurses and EMTs hurried to help. Too many patients. Too many unfortunates. Lily may have a regrettable rest before further assessment and much needed help. I glanced back behind the curtain one last moment before beginning my paper work and chores that would lead me back down the dark streets toward the station. Lily sat propped up against pillows, eyes closed, breathing unevenly, sunken somehow smaller than real life. I completed my restock and paperwork in no hurry. Dan and I prepared to push the gurney back out to the ambulance when I noticed Colleen peer back around the curtain separating Miss Lily from the rest of the ED. She looked both puzzled and amazed. I know her to be a competent, experienced ED nurse, unlikely to be taken unaware by any bizarre emergency room action. But something had derailed her. I approached as she drew back the curtain to reveal a beaming Miss Lily, perky on her pillows, sitting up straight and magically larger-than-life. Shock did not have time to register. I felt the way Colleen looked and drew in closer to learn more. “Lily, dear, you look much better,” I offered in the form of a question. “Which medicine was that?” I look at Colleen but direct my inquiry to Lily. There hadn’t been anyone to administer any medications. “Why, the little pill the nurse gave me, the nice nurse with the white cap,” Lily beamed, smoothing the bedclothes across her lap. I pictured the crisp, starched-white pointy hats worn by nurses’ years ago. My own RN sister hated wearing hers for even the graduation photo. I lifted Lily’s hand gently and with the kindest of eye contact wished her a Merry Christmas. As we departed the peaceful bedside, I turned to Colleen, my expression mirroring hers: incredulous, baffled, stunned. We’d just witnessed a miracle. “Do you believe in angels?” she asked, in an almost conspiratorial murmur. There simply existed no rationale to account for this experience. No nurses had been available prior to Colleen, let alone a nurse from an old movie in a white hat. Pain medication in a case such as Lily’s would have been administered intravenously, not orally, and in any event, Lily already had an IV line established courtesy of transport protocol and my partner Dan. Yes, I do believe in angels. Angels guarding my family as they traveled the Western states to celebrate together without me. Angels whispering in my ear to relieve my co-workers of their Christmas shifts. Angels preparing the path for Colleen’s eventual salvation. Angels intervening in remarkable and unremarkable ways everywhere, all the time. Dr. Karen Tracy is a retired dentist living in Joshua Tree with her kitty Bela. She has lived in the Morongo Basin since 1984, weekending here since 1977. 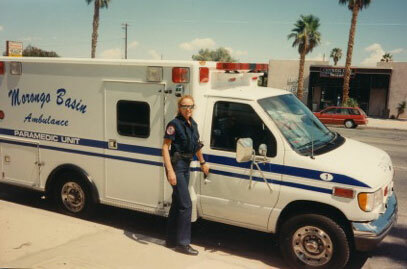 She worked from 1991 to 1998 as an EMT with Morongo Basin Ambulance where she learned much and acquired material for many stories.